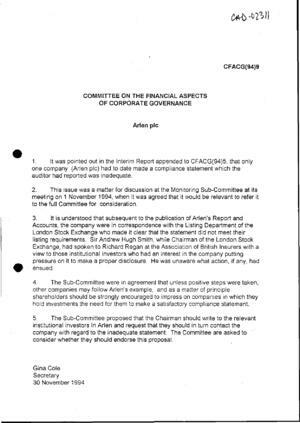 Cambridge Judge Business School : The Cadbury Archive : Arlen plc CFACG(94) 9. Arlen plc made a statement about compliance with the Code which auditors reported as inadequate. As a result it was requested that Sir Adrian Cadbury write to the institutional directors requesting they should contact the company. See press cutting file for 3-page extract.